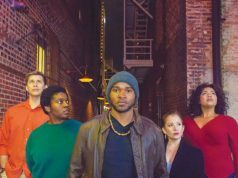 Friends and family members crisscross and sometimes cross one another in Circle Theatre’s latest. Courtesy of Circle Theatre . Emotional release raineth all over the stage at Circle Theatre, where the company ushers in its 37th season with newly named executive director Tim Long, who takes the place of Circle co-founder Bill Newberry. 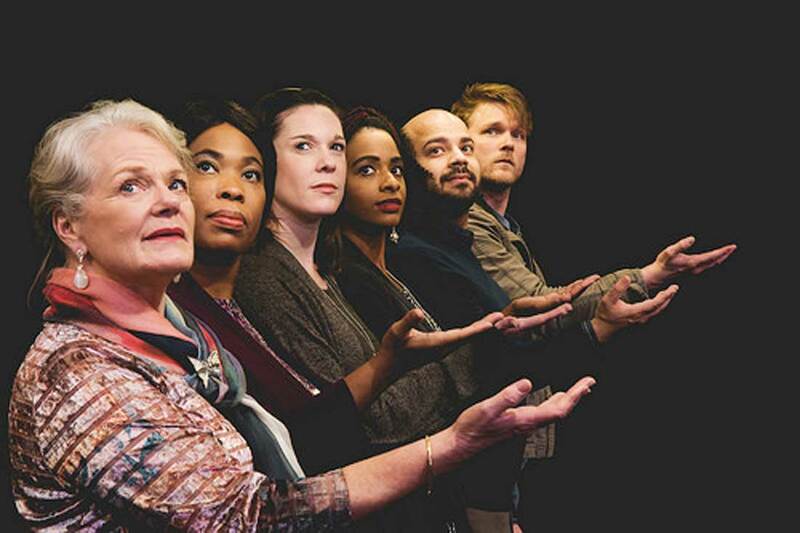 Sprinkle in the celebratory energy of the theater’s new artistic direction, a sturdy cast, and a North Texas following that’s fond of Steven Dietz scripts, and the forecast looks certain for the theater’s latest production. This Random World’s travel-focused plotline makes jocular examinations of people’s inability to understand loved ones, a well-paced spiral of missed connections, and humorous redirections. Sitting on a rug and under a blanket is Tim Ward (Kyle Igneczi), a computer programmer turned relationship recluse whose badgering, know-it-all sister Beth (Desirée Fultz) has the answers for fixing everyone’s problems but her own. Beth, like her mother Scottie (Libby Villari), seeks solitude in faraway places, where she ends up finding deeper dissatisfaction and emptiness than she had in the first place. These grown children pity their invalid mother, who they never see and who is never in town much anyway seeing as how Scottie’s health aide (Crystal Williams) helps her jet off the grid. In other parts of town, a guy (Jovane Caamaño) is breaking up with a girl (Catherine D. Dubord) who’d previously broken up with him because she can’t get over her feelings for Tim, and a chipper funeral home staffer (Camille Monae) is trying to convince Tim he’s a ghost. As the characters’ conflicts send them slipping past one another, serendipity brings them closer to each other and the problems they’ve been trekking past. Dubord’s intensity and consistency of character modeled an unbridled endurance seen only on occasion at black box theaters, but her spirited showing provoked equally as much fervor from Caamaño and Igneczi. On an island by herself was Fultz, whose constancy kept a pace all her own and markedly distinct from the other actors. Local favorite Villari was relentlessly likable and charming in a role that seemed almost written for her. With the majority of characters onstage frothing in fits of anxiety and agitation with one another, this cast was well-rounded by the steady complexity Williams presented in her acting. As a moral anchor for the others, her performance demanded a tensely attentive audience to slow down and simmer over her lines. Opposite Williams is Monae, whose seemingly static character bolts forward in an unexpected display of round character development when her deeply repressed tears unite with the waterworks happening onstage. 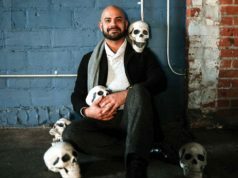 New to Circle is Artistic Director Matthew Gray, who has served half a dozen theaters in North Texas in varying capacities throughout his career. Gray didn’t pull any surprises in terms of overall design, which is in keeping with what most companies are showing with this production. The perimeter of the slightly elevated stage was pebbled with loose pea gravel that counterbalanced a secondary raised platform resembling a large wooden pallet, located upstage. Each scene was marked with a transition in props: characters carrying in and out furniture, such as a coffee-stocked reception desk and a vinyl diner booth. Sound design was kept to a purposeful minimum, adding ambiance to a few moments and transitioning the audience out of one scene and into another with only a few interruptive notes. The greatest impression of all came pouring from above, a special effect of a rainstorm that fell from the ceiling, collecting in the open spaces of the pallet, and drenching Monae and Fultz in a moment of soaking wet catharsis. While there is no singing in the rain in this dark comedy, there is an abundance of harmonizing to the tune of life’s greatest questions. No actor onstage lingers for too long over a singular question – such as “What does travel give us?” or “Why do we fear emotional closeness?” – but Dietz’s writing invites theatergoers to feel warm and certain of our own answers just before smashing that confidence into shards of uncertainty. Good riddance. Some postmodern playwrights have been bellowing answers rather loudly lately, so it is delightful to be confused on our own terms. Every cast member masters the art of finding humor in philosophy, which made nearly every theatergoer visibly captivated until the end. 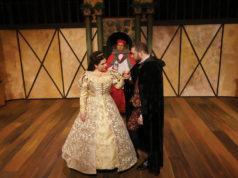 Thru Feb 24 at Circle Theatre, 230 W 4th St, FW. $20-38. 817-877-3040.